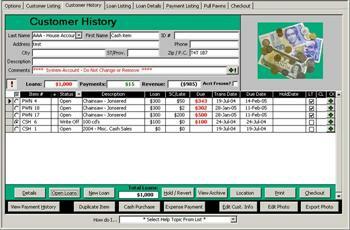 Our pawn software was originally designed by a pawnbroker with day-to-day operation as the highest priority. Our primary testing and development facility for 5 years now is a group of 3 multi-staffed, high volume pawn shops. 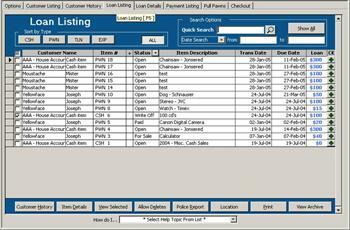 Our pawn shop software will provide the professional pawnbroker software for their small business that is the leading alternative to costly, overly complex pawn programs. The Windows® based interface allows you to scan each screen and simply select the option you want with a single click of the mouse or keyboard hotkey. 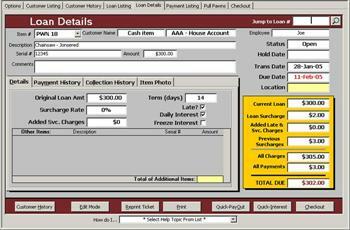 By avoiding the use of extensive drop-down menus, we place the power of the program at your fingertips. 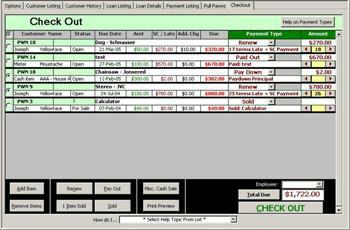 The layout of Pawntastic was especially designed for handling multiple customers and tasks at once, which is an essential feature for your busy store. By allowing you to "flip" back and forth between tasks, it allows you get your job done faster, easier and more effectively. We intentionally avoided lengthy drop-down menus in favour of a tab-based layout to allow you access to all of your options visually. Got the blues from staring at the greys? Our aesthetic design incorporates a number of pleasing colors to help you and your staff avoid eye strain and boredom. Training is simplified as well by allowing new users to relate to the appropriate screen using their color memory. We at Pawntastic Canada understand that you may already have your own way of doing your finances, and may not want to sacrifice that for the sake of automating your business. Our pawn program allows you as little or as much reporting as you need to suit your style of operations. Our focus on creating an Inventory management system instead of a complex point-of-sale system gives you the power you need for easily keeping track of a high volume of customers, loans and inventory, while still respecting your needs for accountability. Is this software intuitive for someone who is a novice with computers? What type of printer requirements is this software set up for? What size paper are the pawn tickets? Does it meet U.S requirements? Do we install the software ourselves? 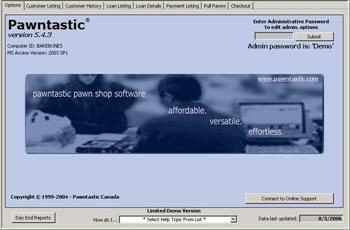 Does Pawntastic work with Access 2007?